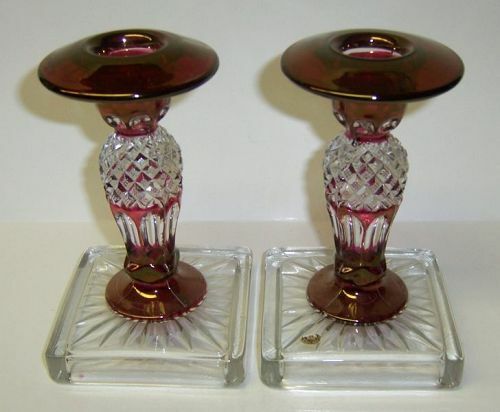 This is a really pretty pair of Ruby Flashed Wakefield, aka Waterford, 5 1/2 inch high single Candle Holders made by Westmoreland Glass. These Candle Holders are in very good condition with no chips or cracks. The ruby flashing is all very good. Part of the original Westmoreland label is still attached. Be sure to search our other Westmoreland Glass available. We guarantee items to be as described. THANK YOU. 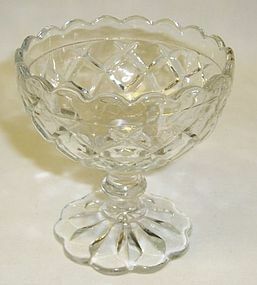 This is a pretty crystal clear Waterford Waffle 3 1/2 inches high Scalloped Footed Sherbet made by Hocking glass from 1938 to 1944. This Sherbet with the top and foot scalloped is hard to find. It is in very good condition with no chips, cracks or scratches. Be sure to search our other Waterford available. We guarantee all items to be as described. Feel free to email any questions. THANK YOU. This pretty pink Waterford, aka Waffle, depression glass 5 1/4 Inch 10 Ounce Footed Tumbler was made by Hocking Glass from 1938 to 1944. This Tumbler is in very good condition with no chips or cracks. Be sure to search our other Hocking glass available. We guarantee all items to be as described. Feel free to email with any questions. THANK YOU.